Summer Slam is a four day Vacation Bible School for kids just completing 1st-5th grades! This fun FREE event is filled with exciting worship, Bible lessons, games, crafts, awesome prizes and so much more! Every night we kick off the night with high energy worship and praise to Jesus! 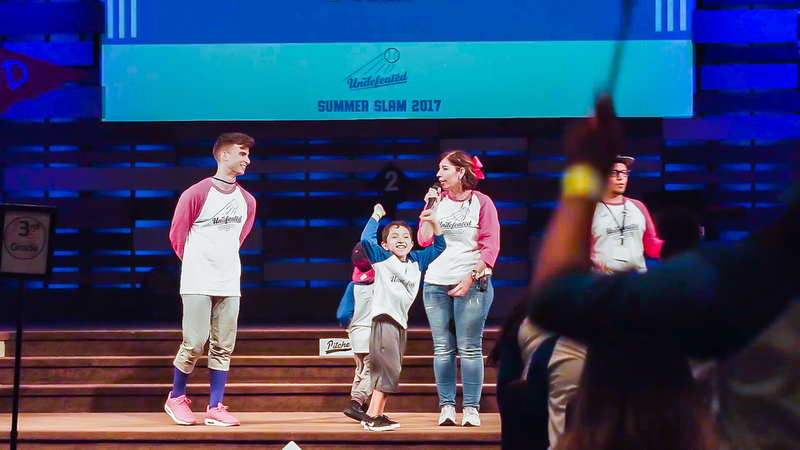 Our worship at Summer Slam is more than just a time to sing great songs but it’s also a time for the kids to experience God’s love through music. The Bible lessons are created in a fun simplified way children can understand. We have lots of fun in store the entire night from crafts, games, prizes and worship! Registration for Summer Slam begins July 8th at the Summer Slam table in the lobby after each Sunday service. Pre-order your t-shirt and wear it to Summer Slam each night! Cost is $15.00. Click the button to go to our giving page and give a monetary gift to help support! • Donate gift cards or prizes that can go to either a boy or a girl and that is appropriate for elementary school kids. • Donate individually wrapped snacks. If you are a regular attendee of New Life, we also need lots of volunteers! Sunday July 1st & July 8th there will be a form in your bulletin that lists all the areas to serve. Please fill that out and drop it in the offering buckets or at the info center. Please note…there is a mandatory volunteer meeting Monday, July 9 at 6:30pm for all volunteers.